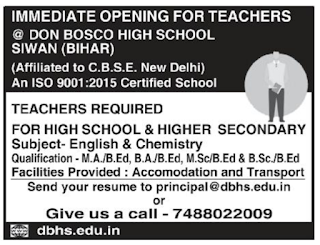 Don Bosco High School, Bihar has advertised in THE Samaja newspaper for recruitment of /PGT jobs vacancies. Interested and eligible job aspirants are requested to apply immediately.Check out further more details below. 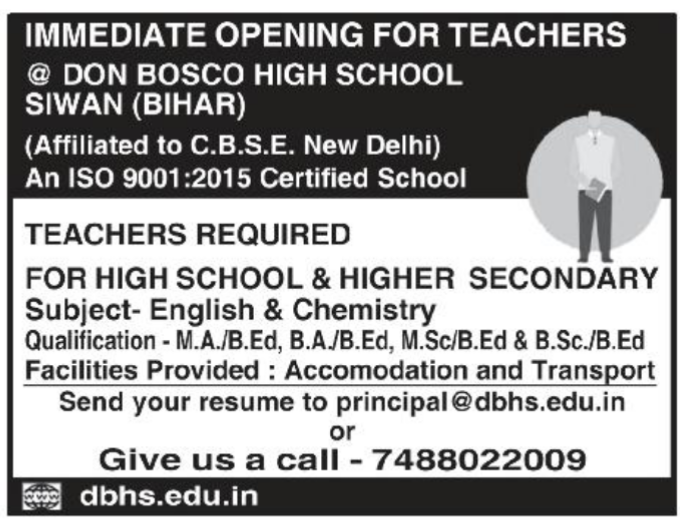 Name of the School: Don Bosco High School, Bihar. About School: Don Bosco High School has been established to make children self-dependent and well aware of their surrounding. Every day our teachers and staff strive to help students aged between 3+ to 16, from all backgrounds, cultures and educational levels to learn, thrive and grow. The entire gamut of activities in DBHS reflects its objective of nurturing young children and making them responsible adults who can make a positive contribution to the world. Don Bosco High School, Bihar.